Born to the Famous Baldwin Family on November 22, 1996, Tucson, Arizona, U.S. Hailey Rhode Baldwin is the daughter of Stephen Baldwin an American actor, producer and Kennya Deodalo, a graphic designer. Hailey is a married woman since September 2018. She is now Justin Bieber’s wife and loves to call herself Hailey Rhode Bieber. Apart from that this young beauty has made her own identity as an American model, and television personality. Hailey is known for her work in 2005 documentary movie Livin It: Unusual Suspects, (2009) Saturday Night Live, (2015) Secrets of New York Fashion Week documentary movie. Baldwin has c0-hosted many shows and appeared in music videos of Cody Simpson’s On My Mind (2011) and Baptiste Giabiconi’s Love To Love You Baby (2016). Hailey Baldwin has been nominated twice for Teen Choice Awards in 2016 and 2017. Blonde hair, Hazel eye color, height of 5 ft 7.5 inches, beautiful Hailey Baldwin net worth undoubtedly is considerably huge. And the best part is she is happily married to her famous Canadian boyfriend Justin Bieber. It was certain that Hailey and Justin were hanging together as Bieber’s social media was flooded with pictures of them along. But none of them confirmed about their relationship. Not until the couple got engaged. Yes, Justin proposed and Hailey said Yes! On July 7, 2018, the famous duo showed everyone that they are seriously in love with each other. Justin has mentioned, in fact written a love letter to his fiancee Hailey in his Instagram post. He said that he is so much in love with everything about Hailey and he is committed to spend his entire life knowing about her. Justin had given a clue that he will marry Hailey soon as he mentioned his brother and sister will witness another stable marriage. He kept his words. However nobody ever had a clue that Justin Bieber and Hailey Baldwin would marry so soon and in a secret manner. Rumors spread around everywhere that Hailey married Justin secretly in New York City CourtHouse in September 2018. But both the couple hadn’t commented anything about that until Thanksgiving. And Hailey too is seen wearing diamond necklace with Justin’s name along with 10 carat oval diamond engagement ring. 21 years old model, Hailey Baldwin Net Worth is of $3 million. Hailey Baldwin Net Worth accumulates income comes from Modeling, endorsement brands like UGG, Adidas. Hailey Baldwin initially signed with the New York modelling agency, Ford Models. She then started appearing in famous magazines such as ‘Tatler,’ ‘LOVE,’ ‘V’ and ‘i-D.’ She appeared in her first commercial for the clothing brand named French Connection in 2014. In December 2014, she participated in a photo-session for the ‘LOVE’ magazine. A short movie of the session released on the official YouTube Channel of the magazine. Hailey appeared in Ralph Lauren commercial with Australian singer Cody Simpson. And In October, she walked on the runway for designer Tommy Hilfiger and Philipp Plein. Later in 2015, she signed to Heroes Models, a reputed modeling agency. Along with a Ralph Lauren campaign, Hailey Baldwin involved in an editorial shooting for the ‘Vogue’ magazine’s Korean edition as well. She advertised for a sportive clothing collection by designer Prabal Gurung. She was featured on the French magazine ‘Elle’ as well. Alongside her modeling career, she made a few T.V. appearances. In 2009, she appeared on ‘Saturday Night Live’ in a cameo role. She also hosted the MTV Europe Music Awards, which held in Milan, Italy in 2015. Hailey is fond of getting small tattoos and has at least seventeen known ones. Hailey Baldwin’s Tattoo includes delicate script, little symbols and a couple of hidden ones which is designed by her friend Kendall Jenner. Her design reads “Coeur d’Alene” which happens to be her sister’s middle name. Another Hailey Baldwin Tattoo is a small cross on the side of her neck. Hailey has inscribed Roman numeral on her wrist, name on her finger, Gun on her palm, “gente” on her hip, ‘minas gerias’ on her ankle which is a Brazilian State. 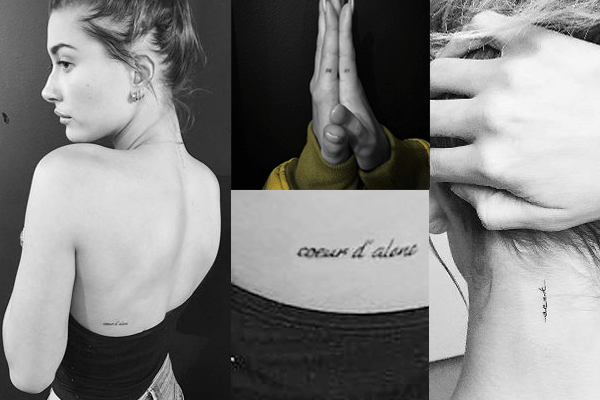 Hailey Baldwin has tattooed dots, star, broken heart and “PRAY” on her fingers. Her neck has “seek,” “unseen” can be found in her spine, cross on her neck. Did Hailey Baldwin undergo a Plastic Surgery? There were rumors of Hailey Baldwin undergoing plastic surgery. But the statement was denied publically by Hailey. Regarding the rumors, Hailey speaks and completely denies the false news. As a child, she got her education at home. Later, she attended Eastern Christian School Association. She was passionate about dancing from her childhood and received training in classical ballet. Hailey wanted to become a doctor and eventually studied medical terminology after her high school graduation. Her older sister Alaia Baldwin is a well-known model. Hailey has a mixed ethnicity as her father is of English, Irish, Scottish, French and German descent while her mother is Brazilian. Hailey’s grandfather is a famous Brazilian musician Eumir Deodato. Be updated with interesting and exciting celebrity bios, entertainment, news, and articles in SuperbHub.